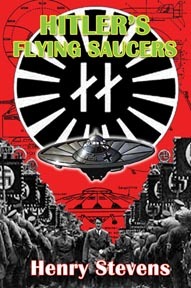 WWII expert Stevens shows us the incredible and suppressed technology of the Third Reich and its desire to create highly advanced “wingless” aircraft—yes, flying saucers! Learn why the Schriever-Habermohl project was actually two projects, and read the written statement of a German test pilot who actually flew one of these saucers. Find out about the Leduc engine, the key to Dr. Miethe’s saucer designs. Discover how US government officials kept the truth about foo fighters hidden for almost sixty years and how they were finally forced to come clean about the German origin of foo fighters. Learn of the Peenemuende saucer project and how it was slated to go atomic. Read the testimony of a German eyewitness who saw magnetic discs. Read the U.S. government’s own reports on German field propulsion saucers and see how the post-war German KM-2 field propulsion rocket worked. Learn details of the work of Karl Schappeller and Viktor Schauberger and how their ideas figure in the quest to build field propulsion flying discs. Find out what happened to this technology after the war, and how the Canadians got saucer technology directly from the SS. Find out about the surviving Third Power of former Nazis. Learn of the US government’s methods of UFO deception and how they used the German Sonderbuero as the model for Project Blue Book.